How many Units (480 ml)? Adult women seem to be the ones most interested in getting enough calcium as they strive to prevent osteoporosis (loss in bone mass). It may surprise you though, that the amount of calcium that your body absorbs and utilizes is very small relative to the amount of calcium you consume. Net calcium absorption can be as high as 60% in infants and young children, when the body needs calcium to build strong bones. Absorption, however, slowly decreases to 15-20% in adulthood and even less as one ages. So if you consumed about a 1000mg of calcium today, you absorbed, at most 200mg. First, without getting into complicated chemistry, you need to know that calcium is an atom which carries a charge (it is positively charged, just like the positive side of a magnet). As such, it has a strong tendency to attach itself to other substances that carry an opposite negative charge. Therefore, in nature, calcium is generally attached to other substances, such as amino acids, or it could appear as a salt, such as calcium chloride, calcium citrate, calcium carbonate, etc. However, calcium is absorbed in the intestines in its ionized (detached, charged) form. Calcium becomes ionized through the digestion process in the stomach, as enzymes assist in cleaving the bond between the calcium and the compound it is attached to (again, this could be an amino acid, citrate, carbonate, etc.). The efficacy of this process varies and depends on factors such as age, digestive capacity, etc. At the end, less than 20% of all the original calcium is freed up and ionized and available for absorption. Generally, the less calcium you ingest at any given time, the more of it you will absorb. The vast majority of the calcium gets absorbed throughout the small intestines (which are longer than the large intestines) in two different ways. Higher up in the small intestines calcium is absorbed in a process called “active transport”. This process requires energy and is fueled by a substance called ATP and by vitamin D. It is somewhat like a rotating door that allows the calcium to get in. ATP and vitamin D provide the “door” with the energy (or the “electricity”) to rotate. When the amount of ionized or free calcium is relatively low, most calcium will get absorbed by the intestines in this fashion. This is why you hear that calcium needs to be taken with vitamin D. Vitamin D facilitates or fuels this absorption process. In the lower two thirds of the intestines calcium gets absorbed through ion channels. Calcium absorption through ion channels is a far more efficient process with a greater absorption rate as it requires no energy. As long as there is an abundant supply of ionized calcium (which is uncommon), all the ionized calcium will diffuse through these channels effortlessly. Because most calcium supplements are absorbed at less than 20%, most of such calcium is absorbed through the less efficient active transport process. How much calcium are you getting from supplements? Here is a little lesson in “calcium mathematics”. Say you consume 500 mg daily of calcium in the form of calcium citrate or calcium carbonate. This does not mean that you have 500 mg of calcium available. 500 mg corresponds to the calcium and the citrate together. So in calcium citrate, calcium accounts for 21% of the molecule. This means that out 500 mg calcium citrate you get 105 mg of net (elemental) calcium. Once you ingest it, you absorb at most 20 of the 105 mg, which is equal to 21 mg or less. So many people who think that they are getting 500 mg calcium from such a supplement are actually getting only small fraction. How to maximize the amount of calcium absorbed from a supplement? Enter CaliMag from Innotech Nutrition. 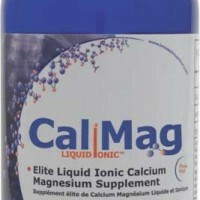 CaliMag is a unique calcium/ magnesium liquid supplement as it offers pre-ionized calcium atoms. The calcium in CaliMag is attached to a molecule called gluconate. However in lab, it undergoes a unique proprietary process to weaken and destabilize the bond between the gluconate and the calcium to such an extent that as soon as you ingest CaliMag the calcium easily dissociates itself from the gluconate without needing to go through the digestion process. What you end up with is a large pool of ionized calcium, most of which bypasses the active transport process, which requires vitamin D and it gets absorbed through the ion channels in the lower parts of the small intestines. This results in close to a 100% absorption. So out of 80 mg of ionized calcium which is available in every ounce of CaliMag you absorb almost all of it. In a single ounce of CaliMag you also get 50 mg of ionized magnesium, which is important in assisting calcium assimilation in bone. Many people who take CaliMag report that they can feel the difference. B. Young from Ontario is a 76 year old lady who was diagnosed with osteoporosis. She started taking the ionic Mag-i-cal recommended by her homeopathic doctor. After one year on this product, her bone density lab results showed an improvement of 6.6%. She has actually gained bone density!!. Her medical doctor was thoroughly impressed with her progress. I utilize MagicCal liquid Ionic Supplement and because I also take fish oil need less of it. So I need to measure it and I have discovered that by using the MagicCal cap for the bottle it is perfect. Filling the cap to the brim is equal to one teaspoon. Pouring MagicCal just so it just covers the second line inside the cap equals 1/2 a teaspoon. This way none of the vital MagicCal is lost. I take 1 1/2 teaspoons daily for the fish oil caused the calcium to adhere to my bones. I have heard and reheard about your product from a 30 year old family owned vitamin store here in Winnipeg, Manitoba, Canada and by my chiropractor and his wife as well. Both sell your product in their places of business and when you advertise Magical as having the highest absorbancy possible where can one go wrong. It is not merely an advertisement it is fact. You have a fantastic product and me being a person who is drawn to creativity whoever named this product chose wisely and well. I have your rasberry flavoring but flavored or not I would use whatever product that best served my needs no matter the taste. However that is just me and I know that I am not the only pebble on the beach because other customers may not feel that way. These are some of my thoughts and I thank you for your time but mostly for a terrific product! "I have had leg cramps most of my life (from about 16) and now they are 100% gone since I began using Magical Liquid Ionic. Magical Liquid Ionic has been a real blessing." "Karen fromIdahoreports her Bone Density test indicates a 7% growth in her bone density in less than one year when using Magical Liquid Ionic." "It has quickly become one of our better selling products. People consistently return to purchase MagiCal. Customers comment that they tried to go without it, but don't feel as good. It, most definitely, is a high end product." S. Maxwell - President Healing Arts and Wellness Center Inc.
"Jennica has had "growing pains" in her legs from age 3-8. Nothing has been able to help her and the family MD said that it takes time to outgrow, all kids get them and to take some Tylenol if it got really bad. These pains usually happened at night after she had high physical activity like playing soccer, bike riding or lots of walking. The pains were so intense that she would wake up from her sleep at night screaming and they wouldn't stop, massage didn't help either. We started giving her Cal-Mag and within 10 minutes of the onset of her pain, she felt better. Nothing, not even Tylenol, worked that fast." "On August 4, 2003 at 11 pm after dinner, I developed bad heart palpitations and had to be rushed to the hospital. The medical staff tried various medications but to no avail. The following day at 2:30 pm, the nurse came in and informed me that if my heart did not stabilize by 3:30 pm they would have to administer an electrical shock. A month before this happened, Rose Stevens, who is my holistic health practitioner, had recommended I take her ionic magnesium supplement as a preventative for any abnormal heart rhythm. I bought some ionic magnesium from Rose, but put it on the shelf until I could do my own research. At 2:30 pm I sent my friend Stan home to bring the ionic magnesium bottle to the hospital because I was scared of the electrical shock therapy and was willing to try anything to bring my heart back into rhythm. At 3:10 Stan poured me 4-5 ounces into a cup. I held each ounce under my tongue, swished it around in my mouth, and swallowed as Rose had instructed me to do. She said it was very quickly absorbed through the sublingual mucus membranes in my mouth. By 3:20 pm the palpitations disappeared and my heart returned to normal rhythm. The nurse came in at 3:30 pm to check my monitor and remarked, "Oh! Your heart stabilized, no electric shock necessary. You can go home now. I guess the last medications that we gave you, stabilized your heart." I know what stabilized my heart. It was the ionic magnesium!!!! As a preventative I take 1 tablespoon of ionic magnesium every night before I go to bed. In order to de-acidify my blood I also take a cocktail of Braggs un-pasteurized apple cider vinegar the first thing in the morning on an empty stomach. I put 2 tsp. in an 8 ounce glass of Nikken purified water which has an alkaline Ph very close to the human body. Acidosis causes many health problems and it is important that we alkalize our bodies to maintain optimum health." "Since using the Mag/Cal my sleep patterns have improved, as have my moods. My nervous system is calmer." "As an athlete, I use Magical to alleviate my muscle discomfort after intense workouts. I can play with the doses to accommodate my level of muscle distress and this product has been my saving grace!"